No you for your interest in our room. The fabric was custom designed for our client and is available thru our firm. If you have any further questions do not hesitate to contact us directly. Wallpaper - What is the name of this wallpaper and where can I get it? The dining room is papered in a muted trellis paper in green and cream. Flanking the bay window are a pair of crystal bird sconces with a pair of marble urns. Over top of the dining table hangs a Russian Crystal chandeleir. The French antique dining chairs are upholstered in a two different fabrics. 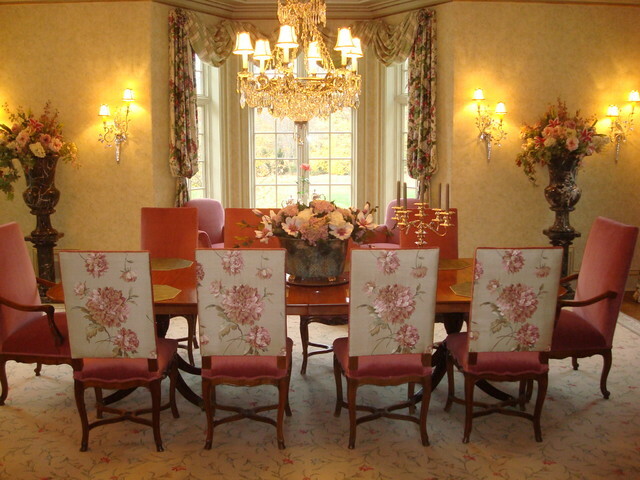 The inside of the chairs are upholstered in a solid mauve velvet, and the backs of the chairs are upholstered in a needlepoint fabric in a floral design resting on a wilton rug.